By default, Comodo Internet Security maintains detailed logs of all Antivirus, Firewall and Defense+ events and stores the log file in Support DataBase (SDB) format as cislogs.sdb file. It is located in C:\Documents and Settings\All Users\Application Data\Comodo\Firewall Pro. Logs stored in this file can be extracted by using a suitable application. Logs can also be exported to html by clicking ‘More.. > File > Export’ in the Antivirus Events, Firewall Events and Defense+ Events interfaces. 'View Defense+ Events' from the Defense+ Tasks interface. The 'Logging' tab of the 'Preferences' interface allows you to configure how CIS should behave once this log file reaches a certain size and also allows you to disable the logging of specific types of event. If the log file's size exceeds (MB): Enables you to configure for deleting or moving the log file if it reaches a specified size in MB. You can decide on whether to maintain log files of larger sizes or to discard them depending on your future reference needs and the storage capacity of your hard drive. Specify the maximum limit for the log file size (in MB) in the text box beside 'If the log file's size exceeds (MB)' (Default = 20MB). If you want to discard the log file if it reaches the maximum size, select 'Delete it and create a new file'. Once the log file reaches the maximum size, it will be automatically deleted from your system and a new log file will be created with the log of events occurring from that instant (Default = Enabled). 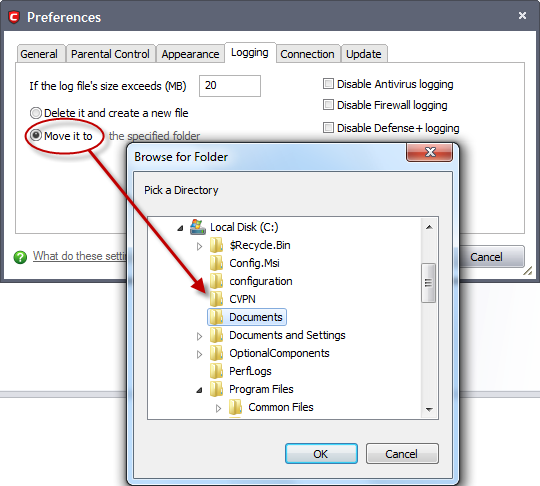 If you want to save the log file even if it reaches the maximum size, select 'Move it to' and select a destination folder for the log file (Default = Disabled). The selected folder path will appear beside 'Move it to'. Once the log file reaches the maximum size, it will be automatically moved to the selected folder and a new log file will be created with the log of events occurring from that instant. The check boxes allow you to disable logging of events according to your preferences. 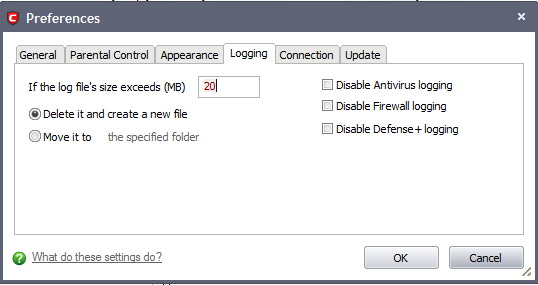 Disable Antivirus logging – Instructs Comodo Internet Security to not to log Antivirus events (Default = Disabled). Disable Firewall logging – Instructs Comodo Internet Security to not to log Firewall events (Default = Disabled). 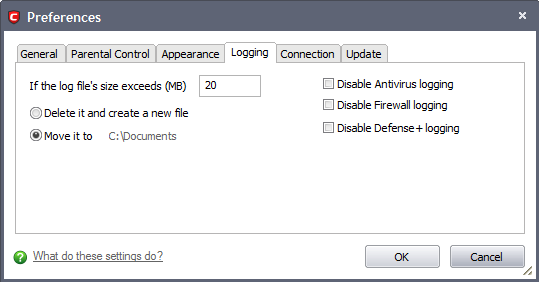 Disable Defense+ logging – Instructs Comodo Internet Security to not to log Defense+ events (Default = Disabled).